To lower your subscriber count and potentially save money on your monthly plan, you might want to unsubscribe inactive contacts from your email marketing. To do this, create a segment of inactive subscribed contacts and unsubscribe them in small groups or in bulk. In this article, you'll learn how to unsubscribe inactive contacts. You may be able to win back the interest of inactive subscribers and earn revenue from them, so it pays to try a re-engagement campaign before you unsubscribe them. To segment and unsubscribe contacts based on their campaign activity, follow these steps. Choose all from the Contacts match drop-down menu. For the first condition, set the drop-down menus to Campaign Activity | did not open. In the third drop-down menu, choose from the list of Aggregate Campaigns. Click Add to create a new condition, and set the drop-down menus to Campaign Activity | was sent. In the third drop-down menu, choose from the list of Aggregate Campaigns. This lets you target subscribers who have been sent the campaigns, but haven't opened them. Check the box next to each contact's email address you want to remove. If you have more inactive contacts to remove than appear on the page, use the bulk unsubscribe method. Click the Actions drop-down menu, and choose Unsubscribe. On the confirmation pop-up modal, click Confirm. If you're worried you might remove new subscribed contacts, add a condition to the segment above. Set this second condition to Date Added | is before | a specific date. Choose a date that was before your last campaign or a couple of campaigns ago to protect any new contacts who haven't received a campaign yet. Contact ratings) are a measure of overall engagement with your emails. We recalculate them each time you send a campaign. To segment and unsubscribe contacts with a low contact rating, follow these steps. Choose any from the Contacts match drop-down menu. For the first condition, set the drop-down menus to Contact Rating | is less than | 2 stars to segment for subscribers with a contact rating of one star. This is considered a negative rating. Check the box next to each subscriber's email address you want to remove. If you have more inactive subscribers to remove than appear on the page, use the bulk unsubscribe method. 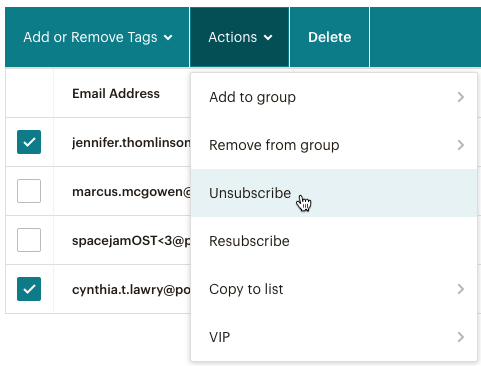 If you have a lot of contacts to unsubscribe, you can create and export a segment, and then use the bulk unsubscribe feature to remove those addresses from your audience. To use bulk unsubscribe, follow these steps. View your segment, and click Export Segment. When the export is finished, click Export as CSV to download a spreadsheet of addresses. While you're still in the Mailchimp audience you're working with, click the Manage contacts drop-down menu, and choose Unsubscribe addresses. Open the CSV file on your computer, and select and copy all of the email addresses in the spreadsheet. On the Unsubscribe people page, paste the addresses into the field provided, and click Unsubscribe. Learn how to win back inactive subscribers with re-engagement campaigns.